A Piece on Pipes » James Betelle, Where Are You? 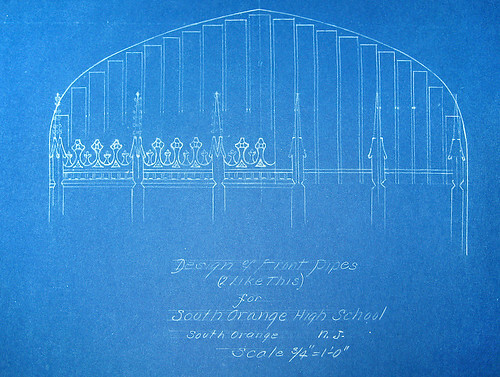 At least four Guilbert and Betelle high schools had pipe organs: Columbia of Maplewood and South Orange, Kearny, Central of Newark, and Great Neck. An organ in a public high school might seem odd, but at the time it wasn’t that unusual. For example, something like thirty high schools in New York City had pipe organs. Most of high school organs were fairly run-of-the-mill types, built by quality, if middle class, firms like Estey and Moeller… the organ equivalent of the Conn or Oscar Schmidt rental instrument you may have used in the high school band. Columbia High School, it seems, decided to be a little different. Instead of getting a merely a good quality serviceable organ, they bought themselves a Skinner Organ. Skinner owned, lock stock and barrel, the prestige organ market. They were not shy in self promotion, claiming in one advertisement for Skinners in schools, “To equip a school or college with a Skinner Organ is like putting a Stradivarius in the hands of the youthful violinist. No greater inspiration could be given. So with the Skinner Organ in school and colleges!” So it’s not exactly “Plop plop, fizz fizz, oh what a relief it is” on the catchy scale, but the accompanying list of colleges with Skinner Organs, (like Harvard, Yale, Princeton, UVA, Cornell, Stanford) really proved that Skinners were for people trying to prove something. Skinner sold his organs to everyone from Vanderbilt, who put one in Biltmore, to the Rockefellers, who had more than one! And of course, Skinners could be found in a ridiculous number of large churches, cathedrals, and synagogues. Many decades later, it turns out the rich gits with their Skinner organs were on to something. Skinner organs, while reviled in the 60’s and 70’s, are among the most revered today. Unfortunately, a large number of these organs were scrapped or modified when they weren’t exactly in style. But a few are still around. 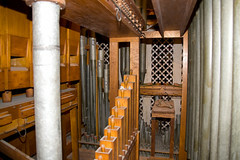 Of the 400 organs recognized by the Organ Historical Society as historic, twenty five are Skinner organs. They’ve become the Stradivarius of early 20th century organs.